Pants: Seems simple, we wear them most everyday, and often without too much thought toward the details. 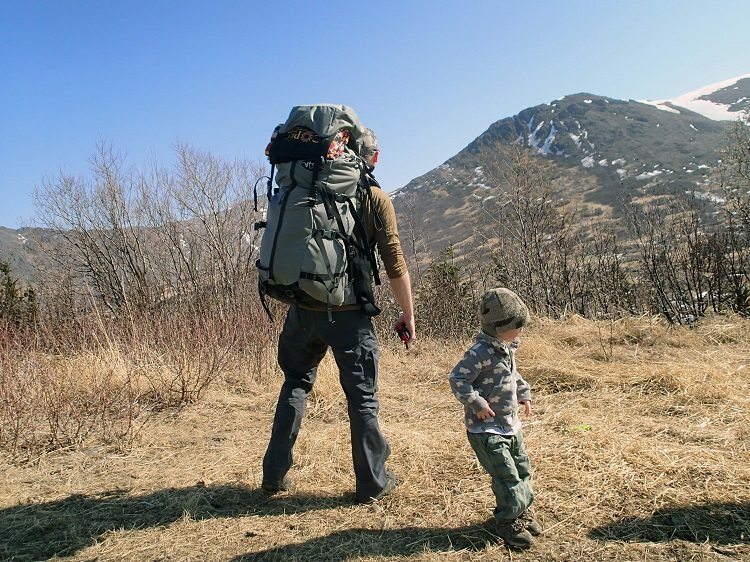 However, to the high country backpack hunter, pants are a critical component of a highly scrutinized gear list. A lot has changed since a pair of Cabela’s Microtex pants inspired the original Sitka Mountain pant. 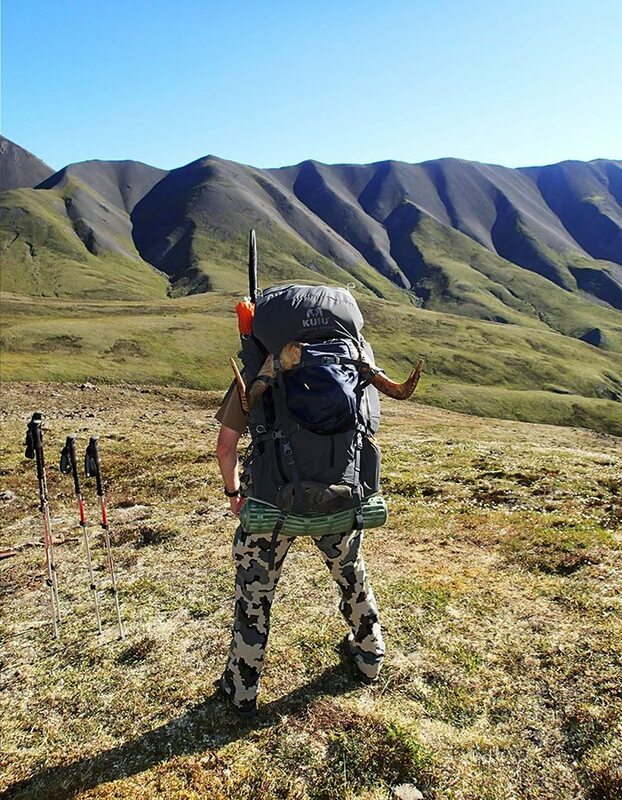 Today’s hunters have a plethora of options ranging from hunting lines to hiking lines, and even unique options like shorts over base layers. I purchased several pants and compared them in detail. I was looking for the ultimate combination of functional utility and comfort. Over the years I have tried “cheaper” nylon hiking pants and some of the Alpine pants offered by other outdoor companies, but none had all the features and performance I was looking for. One of the first true alpine hunting pants, this pant is a good value and has a lot going for it at $70-$80. They also come in tall sizes and feature a standard 6 pocket arrangement. They breathe well and the relaxed fit is true to size. The Microtex dry fairly quickly and are pretty tough. They do pile a bit on the surface, but that does not affect performance. My biggest complaint is the closure on the cargo pockets. It’s not very secure and items can work their way out of the pocket. Point in case, my hunting partner lost a lighter out of his cargo pocket after a SuperCub ride. Thankfully, I was along and had a backup lighter. Mountain House just wouldn’t be the same cold. These pants fly under the radar, but they’re a great pant at a very reasonable price. The Attacks are just about the perfect mountain hunting pant. They are comfortable enough one can wear them around the house and they fit and feel as comfortable as sweat pants. They dry quickly, are highly breathable, and fit very well, although some shorter guys find them a bit long. That is a problem easily fixed and much easier than having pants that are too short. I have both gen 1 and gen 2 Attack pants. I like the hip vents on the gen 2, when open it releases some heat. My original Gen 1 pants have a solid 3 seasons on them and barely look worn. The two rear pockets and cargo pockets are secure and adequately sized. I also appreciate that that the pants do not include an integrated belt. The Attack pants feature the best DWR coating of the group, their ability to both shed water and dry quickly is impressive. By far the superior fabric in the test, especially in terms of comfort. My one complaint with the Attack pants is the front hip pockets. They flare out a bit on me and have a unique cut to them. This causes two issues for me – The pocket fills up when busting brush, and it makes keeping a clip knife secured nearly impossible. I lost my knife twice before giving up on the idea. With that said, the pockets are great for sticking your hands in when cold. Sort of a catch 22 there. 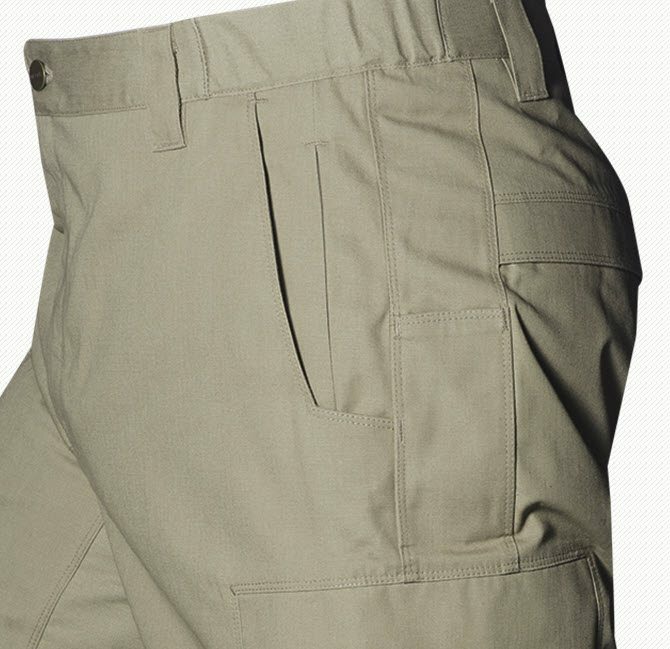 I’d also like to seen an inner pocket within the cargo pocket such as described in my overview of the Vertx pants below. Bottom line, these pants are the standard others must measure against. 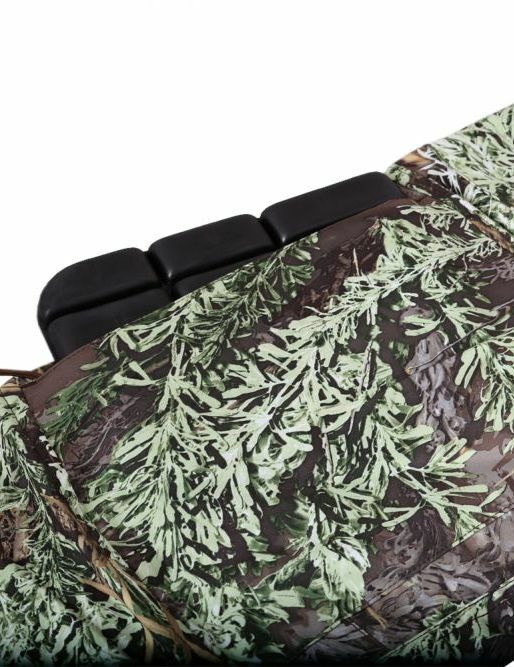 They are offered in both of KUIU’s in house camo patterns as well as variety of solid colors. Initially I did not like the feel of the Kanabs against my skin, as they felt stiff and rough. I washed them with Nikwax Wool Wash and after a wash or two they softened up and were quite comfortable. In general I like the fit, it’s true to size and comfortable. However, the waist on these pants has a stretchy section at the rear that bunches up under a heavy pack load on my lower back. I don’t believe this is an issue with the pant as much as it is an issue with how they fit me. I spoke with a few other guys that wear Kanabs and none of them have experienced the same issue. The roomy front hip pockets are well designed and my clip knife stays put in all but the thickest of brush. 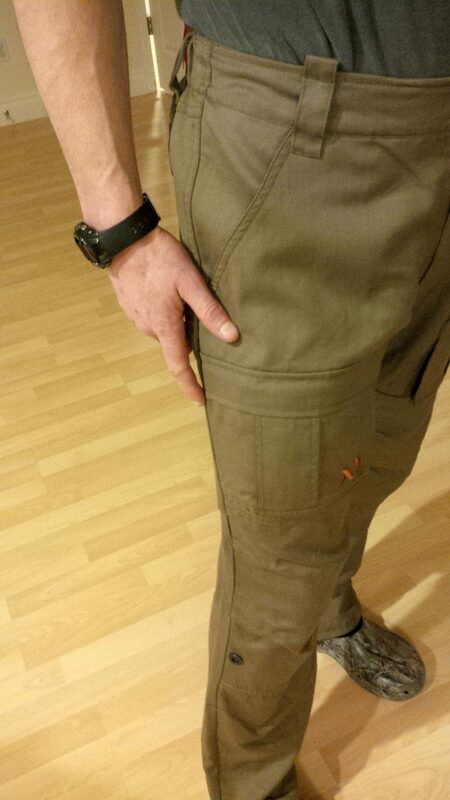 The unique cargo pockets differ from other pants in that they are on the front of the leg rather than the side. 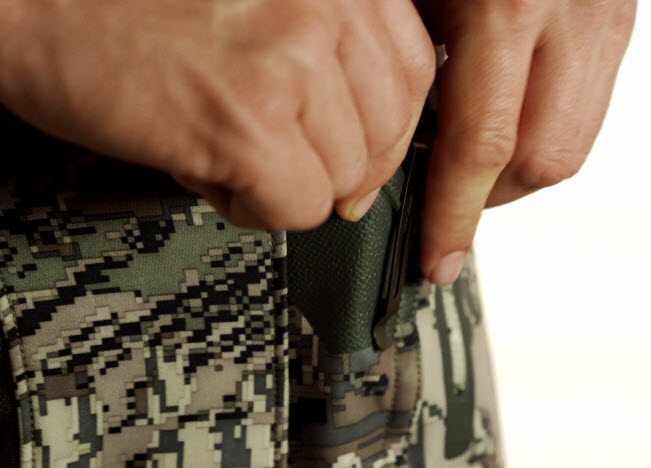 The pockets are well-constructed and adequately sized, but I would prefer zip closures like the KUIU Attack pants instead of the button style closure. I’ll also echo my desire for inner pockets like the Vertx pants. The pants come with belt loops and suspenders. First Lite offers several camo patterns, and I am a big fan of the Dry Earth solid color option. I prefer to wear my Kanabs when it is a bit cooler out. With a thin merino base layer and the rugged merino Kanab pant I can be comfortable down into the teens as long as I am somewhat active. First Lite and other reviewers state they perform well across a wide variety of temperatures, but it’s just not warm enough up here in Alaska for me to confirm how they perform in the heat. These burly pants come in both Optifade Open Country and lead, a solid grey color. I was intrigued by the integrated knee pads and reinforced knees and seat. 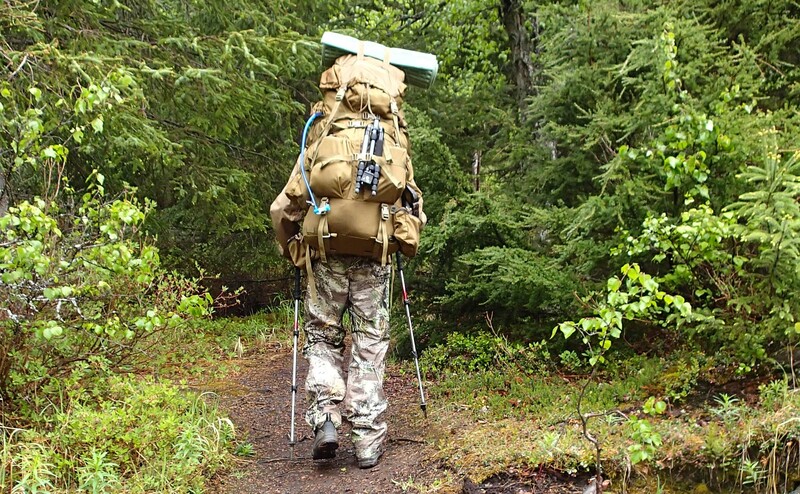 However, they tend to run about ½” to an inch shorter than most other Sitka pants. My waist is in the 31-32″ range with a 32″ inseam. Tall options for Sitka start at 34″ waist and the 32R seemed to have inseam around 31″ or less, too short for me. I think that also made the knee pads ride a little high, as the fit just felt off. I really like these pants. They have one rear pocket (wish they had 2), two zipping front pockets, and two cargo pockets that provide both a secure zippered pocket, and a fold over quiet snap pocket. The bonus knife pocket on the right side was a neat touch that I especially appreciated. While there was nothing wrong with the integrated waist belt system, I prefer robust belt loops so I can run my own belt. Like the Kanabs the Timberlines also include suspenders and I go back and forth on whether I like suspenders in a pant or not. Sitka did inform me that they are considering adding a 32T to their 2015 line. I think that would be a much better option for me than gaining some pounds to keep the 34Ts up! After sadly ruling out the Timberline pant I decided to try the mountain pant. It is basically a lighter version of the Timberline. The material is lighter and it loses the waterproof seat and knees. However, the solid pocket system is still there as are the integrated knee pads. The length on the Mountain Pants is still not perfect, but much better than the Timberlines. 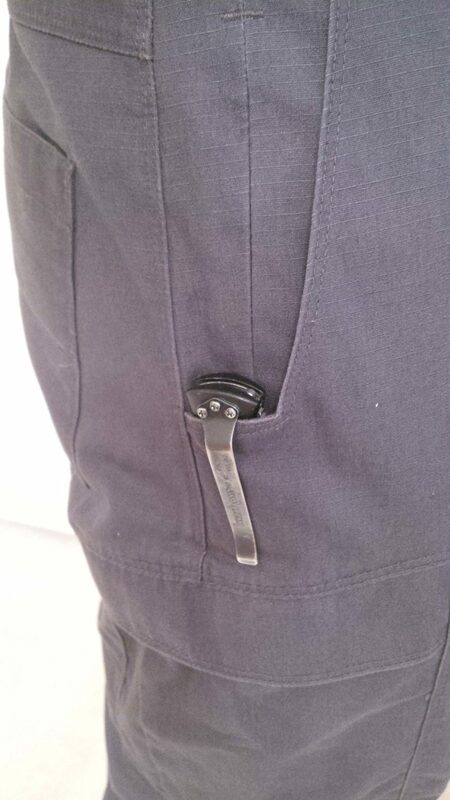 They added a rubberized section on the hip pockets that should make the pants more durable for the clip knife fans and provides a pretty darn secure spot to clip your knife. Like the Timberline pants they have an integrated belt. While the belt works fine I still prefer belt loops so I can run a belt of my choice. I’d also like to see Sitka offer these pants in a few solid colors. As for the integrated knee pads, they work well, stay in place and don’t chafe. However, they do cause your knees to get warm and my pants would be slightly damp at the knee after a hard hike. I am considering drilling some small holes in the rubber pad to see if it breathes better. It would also be handy to be able to remove the knee pads from the outside of the pant vs. the inside. Another thing about the knee pads is how stiff they are. I hope as time goes by they soften up a bit and become more flexible. The material is comfortable, but not as comfortable or breathable as the Attack pants. It takes a little while longer to dry, but it feels somewhat thicker than the Kanabs or the Attacks, so that may affect the dry time. 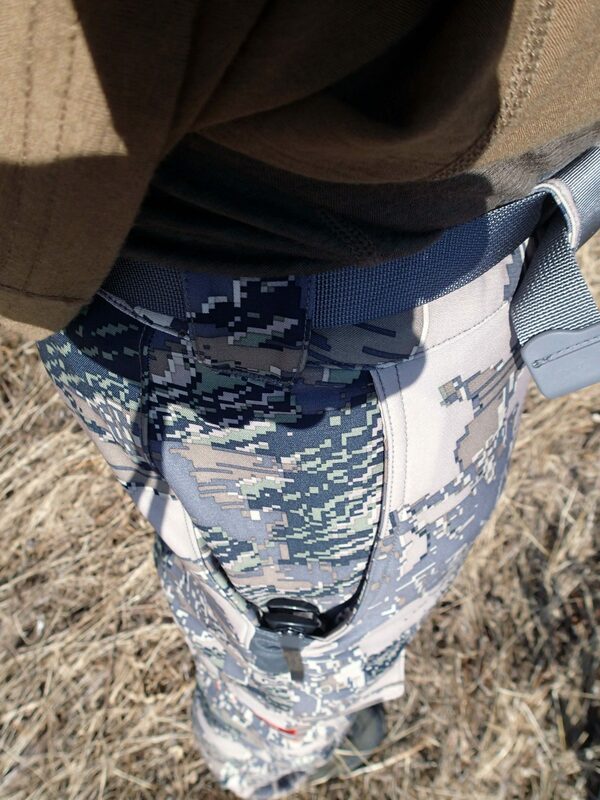 The benefit of having integrated knee pads makes these pants a must have for the mountain hunter. 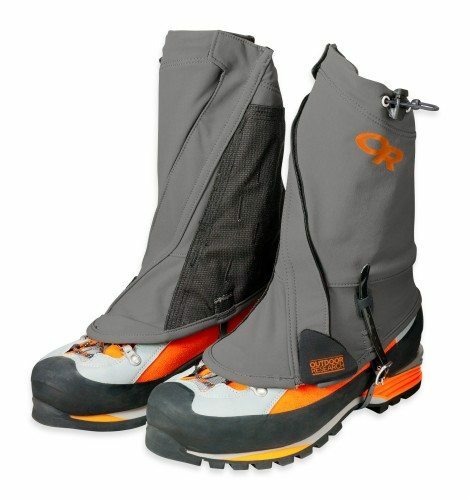 However, you have to choose your gaiters carefully (taller gaiters interfere with the knee pads). 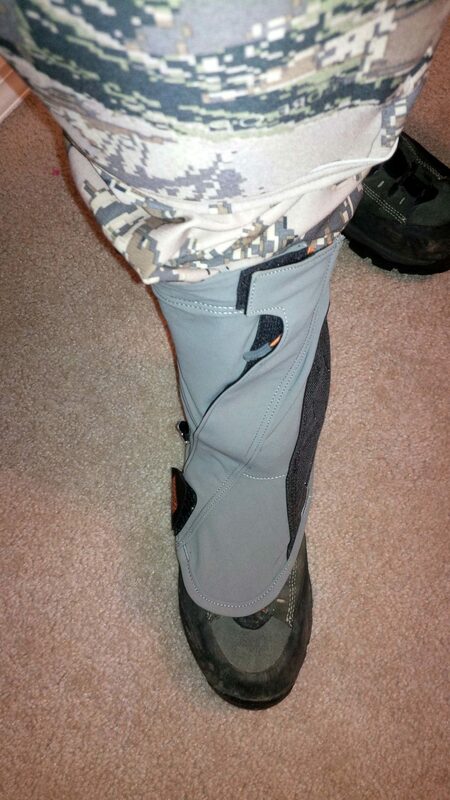 So far I have found the OR Endurance Gaiters to work pretty well. More testing is needed to see how they perform in harsh weather, but they are short enough on the leg that they do not interfere with the knee pads. Core4Element’s Switchback Pant is the lightest material of the pants I tested. It’s built very similar to the Sitka Mountain Pant, with one key difference, the knee pad pockets are located on the outside of the pant. They breathe as advertised and seem to be constructed pretty well considering the light weight material. The knee pads hang low, just below the knee, but ride up as you kneel down. It’s a unique feature that takes a bit of getting used to. Also since the knee pad pockets have a zipper I would occasionally kneel on the zipper. I just had to be more thoughtful when kneeling down. Like the Mountain Pant I struggled to find a way to make gaiters work with these pants, primarily because the knee pads on the Switchbacks hang much lower than on the Mountain Pants. 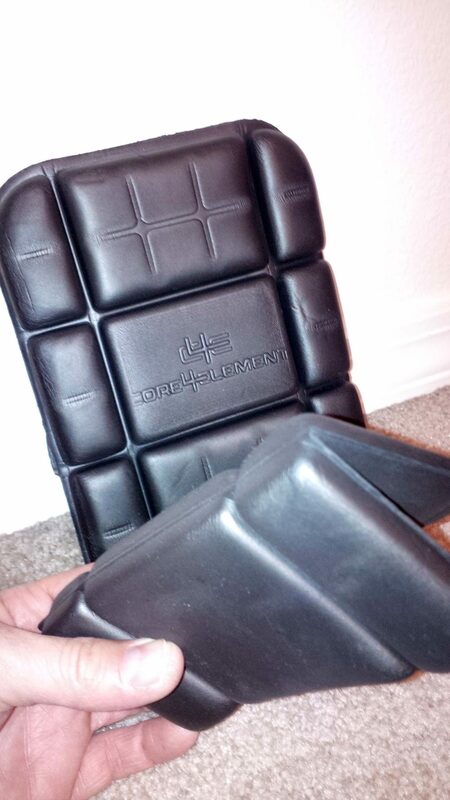 The knee pads are much more flexible though and this makes them more pliable. Also, these pants only come in Max1 and I would like to additional patterns and some solid color options to round out the offering. For a MSRP of $119 these pants are good option for someone looking for a warm weather pant. These are not a hunting pant per se, but good, solid color options (Law Enforcement Black, Khaki, Desert Tan, Olive Drab Green, Navy, Smoke Grey) make this a versatile pant for the outdoorsman. Some of their other product lines are even available in various Kryptek patterns. My favourite thing about Vertx pants is the pockets, Vertx has pockets down to a science. I’ve worn a few of their other pants and really appreciate the overall functionality and design. I’ve worn them fishing, hiking, and in a 3 day combat handgun course. These new pants feature a larger cargo pocket than the original Vertx pant, which makes them more “outdoor” focussed, at least in my mind. The biggest weakness is the 65% poly / 35% cotton, mini Rip Stop fabric rip-stop fabric with IntelliDri® treatment; cotton the obvious chief concern. However, even with the mixed cotton fabric I found the pants to dry quickly and breathe comfortably. Vertx states that these pants feature Advanced moisture-wicking and stain repel/release technology with IntelliDry. 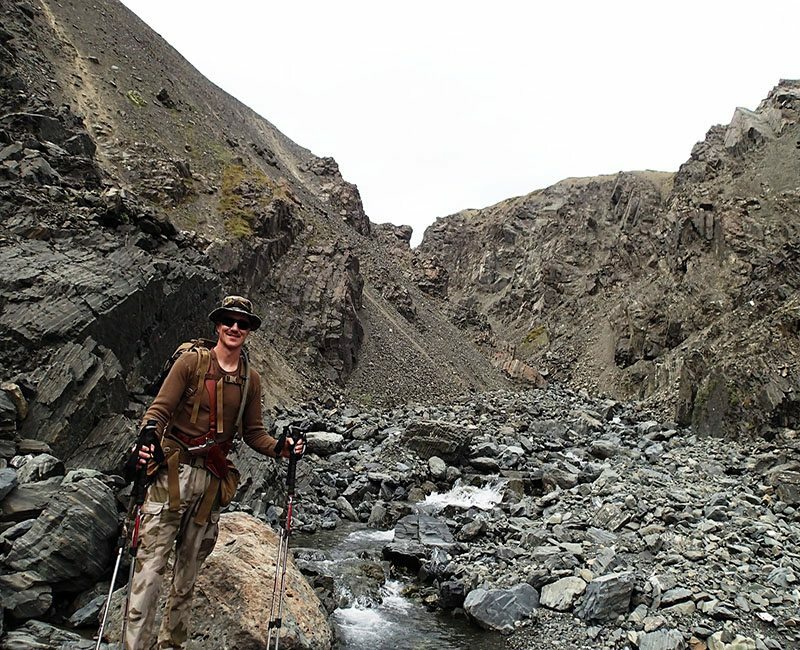 Vertx pants in general are great casual pants and I use the Phantom Ops pants for many outdoor excursions. A bonus feature of the cargo pockets is the ability to slip a Magpul Magazine in the middle lining where it stays secure and ready. All Vertx pants have this inner cargo pocket. It does a great job of containing loose items in cargo pockets and is something more manufacturers should take a look at. Sitka comes close on some of their pants with an outer zippered pocket. • Best Utilized as a semi causal, every day pant. I wear these to work with a polo or dress shirt and they blend in well, especially for a quasi-tactical pants. The pockets are very handy for carrying cell phone, flashlight, knife, keys, etc. • These too can be worn as a semi casual pant, but work well in the field. They are a light weigh material that breathes well and dries surprisingly fast for being 35% cotton. They are ~$10 cheaper than the Phantom Ops pants. 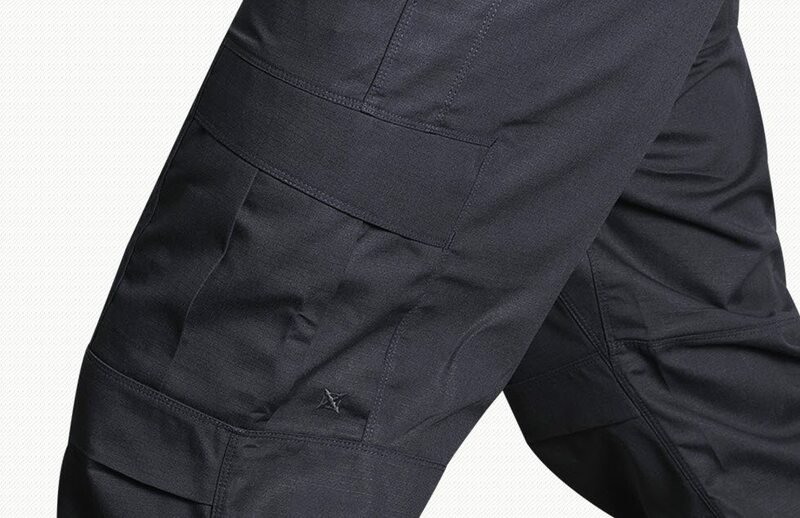 • These are very similar to the Phantom LT pants, but have extra space in the leg cargo pocket, as referenced above. If larger cargo pockets are not needed, I actually prefer the Phantom LT rear pockets over the Phantom Ops rear pockets. The Phantom Ops rear pockets are more secure (fold over flap) but more difficult to access. Both pants excel as a day hiker and for general all around outdoor use. In conclusion it is my opinion that the perfect hunting pant (for me) is a combination of several pants currently on the market. 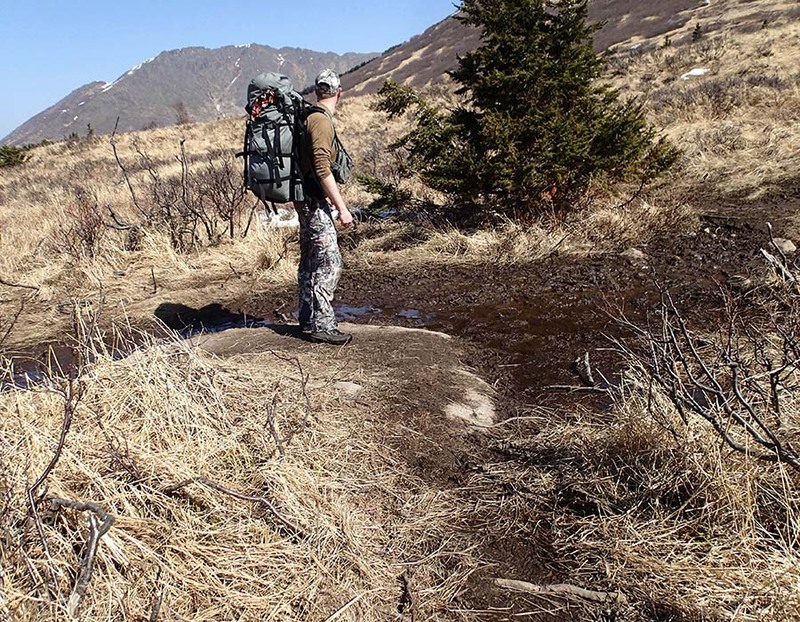 The KUIU Attack pants have been my go-to backcountry pants for the last 3 seasons. They are a high quality, quick drying pant, and despite a few stains they are still ready to roll. If I don’t need knee pads, these are a top choice. The times I want integrated knee pads all but assures my need for the Sitka Mountain Pants. For non-hunting, casual day trips, the Vertx pants are a great option. Several different fabric blends, and many colors are available. Either the Attack Pant length or a true 32″ inseam with a 34″ inseam option on all waist sizes. A good pant should also be available both with and without knee pads. Some people flat out don’t like, or utilize knee pads, and some uses do not require them. Having both options in the line benefits both groups. 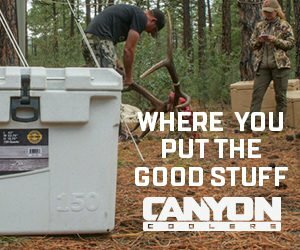 Next articleNeed a Great Boot Deal?